Given that Jobs was the subject of two movies, neither of which fared very well at the box office, it is probably a good idea to sort out matters of the libretto from those of the music. Like the scripts of both films, Campbell’s text is not diachronic. The overall flow is based on several key events, and the temporal context for those events emerges as the opera unfolds. My guess is that this does not have a major impact on how those in an audience are likely to receive the result. 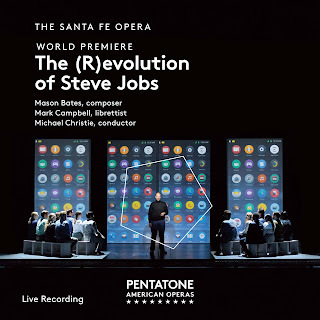 One is not going to attend this opera for the sake of learning about Jobs’ biography, just as one would not go to Doctor Atomic to learn about the history of the Manhattan Project. Nevertheless, there remains the question of whether or not Jobs makes for a good subject for an opera. In many ways the course of his life is a bit like the way in which military historians approach the narrative of war: very long periods during which nothing much of import happens punctuated by bursts of intense (and highly violent) activity. One might almost conjecture that Jobs appreciated that framework and put all of his effort into ramping up the intensity as high as he could. In many respects what made him revolutionary is that he took a culture in which “hacking” was an enjoyable pastime and turned it into a major cultural shift enabled by finding the sweet spot that accounted for both quality design and ruthless marketing. A skilled librettist like Arrigo Boito would probably not have know what to make of such a situation (even with a background that included acute perception of the nature of Venetian politics). So I cannot carp particularly harshly over the fact that Campbell never managed to fare any better in working with Jobs as his subject than either of the Jobs films did. Speaking of Doctor Atomic, when it comes to the music, many passages seemed to suggest that Bates was having trouble finding his own voice in a setting in which so much musical context has been established by the “historical” operas of John Adams. This is not to suggest that Bates was not up for writing for voice. HIs “Mass Transmission” remains, in my mind, one of the most skillful approaches to working for both choral and solo resources in a setting in which Bates could exercise his particular talents for electronica; and, as the title suggests, those talents also include working with texts that address technology-based subjects. However, if “Mass Transmission” demonstrated how many things he could say about a few basic ideas over a comparatively short duration, it seems as if Bates could not figure out what he wanted his music to say about Campbell’s text or how the music would say it. To be fair, there are operas in which the talents of both librettist and composer only begin to register when presented in conjunction with imaginatively-conceived staging. That modifier is particularly critical and may explain why I came away much more satisfied with the Metropolitan Opera production of Doctor Atomic (which I had experienced only through HD video) than I had been when I first saw the opera produced by San Francisco Opera with staging by Peter Sellars. 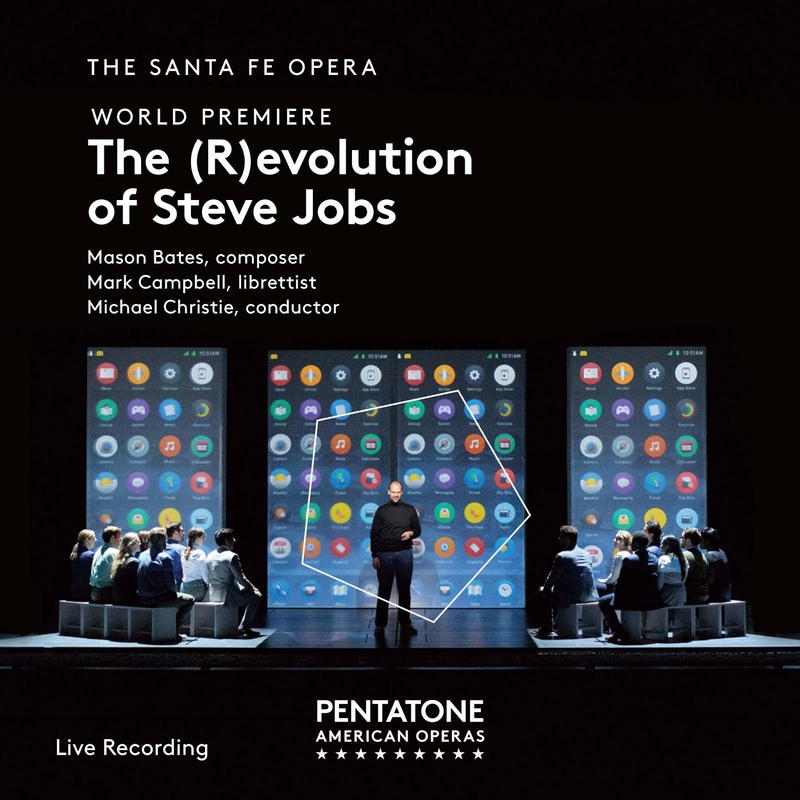 The (R)evolution of Steve Jobs will be coming to San Francisco Opera in the not-too-distant future; and I may well react differently to the Santa Fe recording after having seen a staged performance.